As a mom and someone with long hair (with the refusal to cut it) I tend to dread days when I wash my hair. Hair turbans are my go-to in order to help dry my hair and keep it up before I'm ready to pull out the blow dryer. 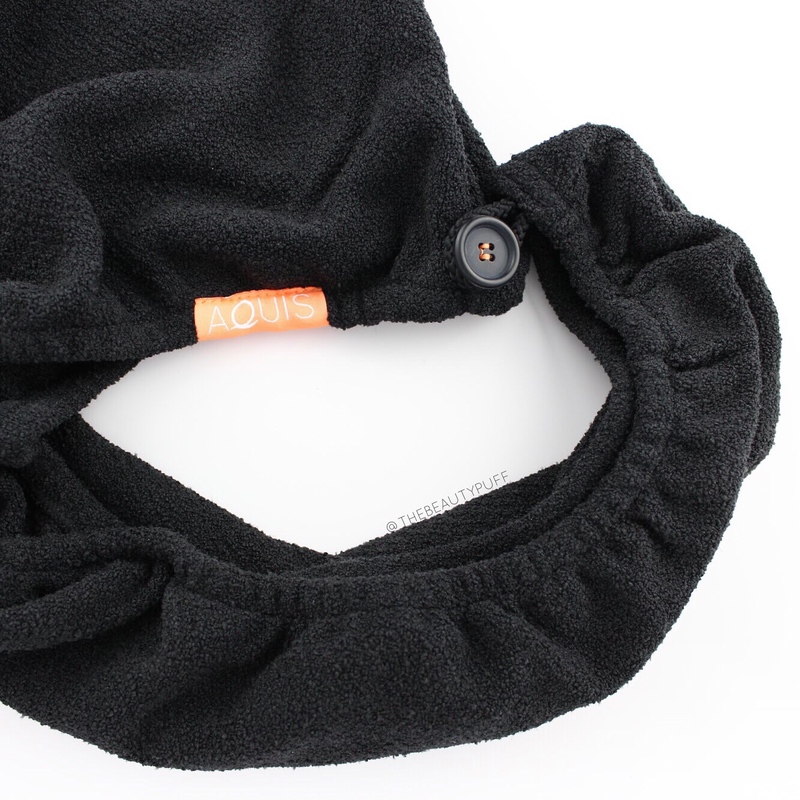 The Aquis Lisse Luxe Hair Turban has been a lifesaver for my shampoo days! It helps keep my hair out of my face until I'm ready to dry, maintains smoothness, reduces frizz and cuts my blow dry time almost in half. Style | The Lisse Luxe Hair Turban is made from Aquitex, which consists of ultra-fine fibers that delicately dry strands to help minimize frizz and wick water away from hair. It's a versatile size to accommodate both short and long hair. The closure is a button with elastic loop so the towel stays in place while you continue getting ready. Colors include: Ivory White, Desert Rose, Cloud Berry, Chevron and Stormy Sky. Care | This towel can be machine washed and dried. Use liquid detergents and wash before first use. Between uses, hang to dry as with any other towel. How To | After washing my hair, I gently squeeze out excess moisture, brush with a wide-tooth comb and wrap in the Lisse Luxe Hair Turban. To wear, just lean over, place the button at the nape of your neck, twist hair in towel and secure with the button on the back. I try to leave my hair in the towel as long as possible before blow drying to maximize the results. When the towel is removed, excess water is absorbed so hair will take less time to blow dry. Results | Each time I use this towel my hair is left feeling light, airy and smooth. Blow drying is actually a pleasure because it takes a fraction of the time it used to. With the anticipated arrival of our twins this fall, I need all the time-saving products I can get my hands on. This towel allows me to spend less time with my blow dryer and get a better results so my blowout lasts longer. Now, instead of washing my hair every other day, I'm able to wait two days between washes! That's music to a mama's ears. You can find the Aquis Lisse Luxe Hair Turban, along with more of their products, on the Aquis website below.